In Reaching Readers we explore different ways to put books in kids' hands and one way to get involved, share reading experiences with your child, AND make an otherwise solitary experience fun and social is through a book club. 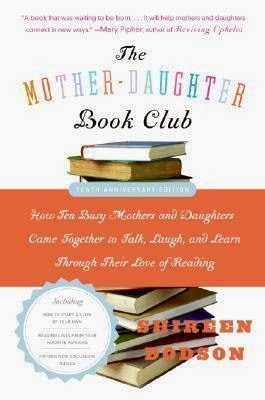 One such type that's gaining in popularity are Mother Daughter Book Clubs (or Mother/Son, Father/Son, etc.). Today I talked with a friend, Janika, who has been "running" one such club for several years now to discuss the ins and outs of making a successful book club work for everyone involved. Welcome to Kidliterati, Janika. How did you get involved with your club? My friend, Maria, and I decided to start it. We don't see enough of each other and our girls have been great friends since preschool. A book group just seemed like a great way for all of us to connect and enjoy one another's company. Sounds like it! How is your club structured? Since it's just two families (but with 5 girls and 2 moms! ), it stays pretty casual. We've met at a restaurant and at my friend's home. We try to meet every month, but it doesn't always work out that way. Maria and I chose the first few books as recommended by a great book, "100 Books for Girls to Grow On" by Shirleen Dodson, also author of "The Mother-Daughter Book Club." The girls enjoyed the books we chose, but then they wanted to choose some as well. So far, they've chosen "Hoot" and "Matilda." A few weeks after having our book group discussion on Hoot, we decided to watch the movie together. It was fun to compare and contrast the movie and book. It gives me a great excuse to read what my kids are reading. I have very different taste in books than my kids and if I didn't have this book group, I probably wouldn't be reading books they are interested in. I also LOVE the discussions (great questions in the 100 Books book). I have learned a lot about my girls' feelings and views on the world from these discussions. It's also a bonding experience since we are reading the same book at the same time. It's almost like sharing a secret language since none of the boys in the family are reading along. It gives me something to talk with them about. What do your girls like about it? I think they really like getting together with their friends and hopefully like the extra attention I am giving them. I think they enjoy choosing, discussing and looking forward to reading the books. My girls rave about the group so often that my eight year-old son wishes we could have a mother/son book group too! Have there been any challenges or lessons you’ve learned along the way? Be committed to actually READ the book! Don't just skim or you won't be able to discuss it intelligently. Make a serious commitment to the book group date. We've had to hire babysitters for other kids so that we can make it happen. I sometimes like to preview the books we read to make sure they will be interesting to the girls. For example, we thought everyone might like to read "Wonder," but after I read it, it seemed that it moved a little too slow and was a little too nuanced to catch the attention of some of our girls. They might enjoy that in a few years, but for now, we're sticking with more action-packed books. Thanks for all this insight, Janika. You're certainly inspiring me (and hopefully others)! I've done Mother / Child book discussions with two of my three kids (shhhh! don't tell the 3rd). With my oldest, a few mothers took turns hosting. The group got so large that it eventually collapsed under its own weight. It became impossible to find time for the group to meet. With my daughter, a neighboring library hosted a monthly parent/child discussion. It was wonderful. The times and reading schedule were set in advance and meetings were held in the library children's department. Unfortunately, the wonderful librarian who hosted the discussions moved on. I drop a comment in my own library's comment box every chance I get.